I am starting with the first video of the pipe CNC. 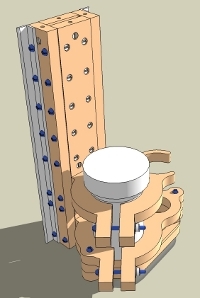 I am going to first demonstrate the concept of how the aluminum angle of the linear slide fits in and connects to the pipe assembly. Then I will construct the entire slide mechanism assembly and fasten it to a 1" pipe. Generally, the concept behind the slide mechanism is similar to the previous machine made of MDF and aluminum angles. With the pipe CNC machine, I use pipe floor mounts to flank the pipe with two similar bearing trucks between the floor mounts and the pipe. In the video, you will see that I use a 1" x 48" pipe. This pipe will serve as one of two x-axis rails. To hold the whole assembly together, I use four 1/4" all-thread rods. All of the nuts to provide pre-loading and to secure the aluminum angles are doubled so the assembly doesn't loosen. 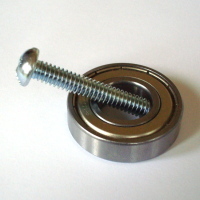 I have found that the assembly is stiffened by tightening the inner nuts that also serve as the truck stabilizers. To make sure the truck is stabilized in place, I use four large washers over the aluminum angle of the truck and tighten them until they bend over the angles, thereby allowing the nuts to secure tightly and provide a very secure slide assembly. 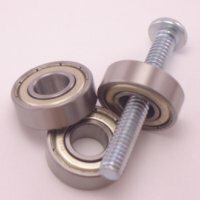 After all of the nuts are very securely tightened, the mechanism is able to slide freely and it does not rack from side to side, even slightly. This aspect of the assembly was my initial worry, and I would have tried another method if this hadn't worked, but it appears to be quite sufficient.